The Gallery Sonja Roesch will host a special exhibition of paintings by Raimund Girke, 1930 – 2002, ‘Investigating White’. Documenta VI in Kassel, Germany, and is known for his investigations of the color white. In the late 1950’s Girke belonged to the generation of young European artists that overcome the Subjectivism of the Abstract Expressionism, and searched for new objective reductive expressions. Girke since then left out the traditional composition, and concentrated on putting the color in order according a line schedule. Indeed, he has taken the color and has written it onto the canvas. Many titles show these characteristics of his paintings. 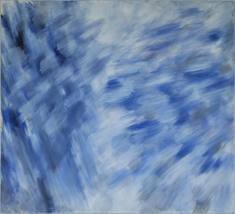 At the same time Girke reduced the colors from his paintings to a white accompanied with blue and brown tones. These formative qualities have always characterized his paintings. In Raimund Girke’s paintings white is not a static thing, it is constantly moving and changing. White is as elusive as it is beautiful. White is emptiness, non-material, quietness, stillness. It is subject and spirit of Raimund Girke’s paintings. Rather than being restricted by his monochromatic palette, he demonstrates it is an entire world in itself, which can be explored and expanded. In this infinite universe of complexity and subtlety, he searches for classical order. Girke explores white as a color and not as a concept. He continues the tradition of ‘Tafelmalerei’, a historical term for the Classical and Renaissance painters who were concerned with order, color and light.